The History of the American Bobtail. The American Bobtail has an uncertian history. It made it's appearance around 1960 and it is thought that the original bobtail bloodline that came was from a short tailed brown tabby, called Yodie, (of unknown parents), and a seal point Domastic female. Yodie was adopted by John and Brenda Sanders, of Iowa, while they were visiting an Indian reservation in Arizona. 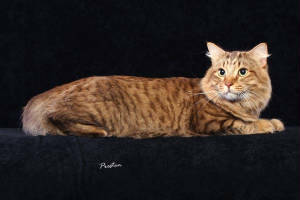 The earliest known breeder of the American Bobtail is Mindy Schultz. She wrote the first provisional standard in the 1970's. By the 1980's todays standard was developed for the American Bobtails. This new line is rumored to have began in Flordia, again by an unknown breeding. This new standard includes all colors, categories, and divisions. Thusly we have todays American Bobtail. American Bobtail Comformation and Personality. The American Bobtails is a breed that is slow to develop. It takes approximately two to three years to mature. Males will weigh between 15 to 20 pounds and the females between 7 to 12 pounds. This breed is a heavier bodied cat. The hind legs are slightly longer then the front. The tail should be 1/3 to 1/2 the length of that of a long tailed cat. It should not reach below the hock of the cat and it may be curved, have bumps, or be slightly knotted, but it must be able to articulate freely. This breed is a playful and outgoing cat. They show an uncommon amount of intelligence and have a dog like demeaner, at times. They love to play but are not overly active. If looking for a loving and intelligent companion, then the American Bobtail is the cat for you.